Check out our new infographic on MSW! Municipal Solid Waste (MSW)more commonly known as trash or garbageconsists of everyday items we use and then throw away, such as product packaging, grass clippings, furniture, clothing, bottles, food scraps, newspapers, appliances, paint, and batteries. This comes from our homes, schools, hospitals, and businesses. Mechanical papers include directories, newspaper inserts, and some advertisement and direct mail printing. Source reduction, or waste prevention, is designing products to reduce the amount of waste that will later need to be thrown away and also to make the resulting waste less toxic. Recycling is the recovery of useful materials, such as paper, glass, plastic, and metals, from the trash to use to make new products, reducing the amount of virgin raw materials needed. Composting involves collecting organic waste, such as food scraps and yard trimmings, and storing it under conditions designed to help it break down naturally. This resulting compost can then be used as a natural fertilizer. 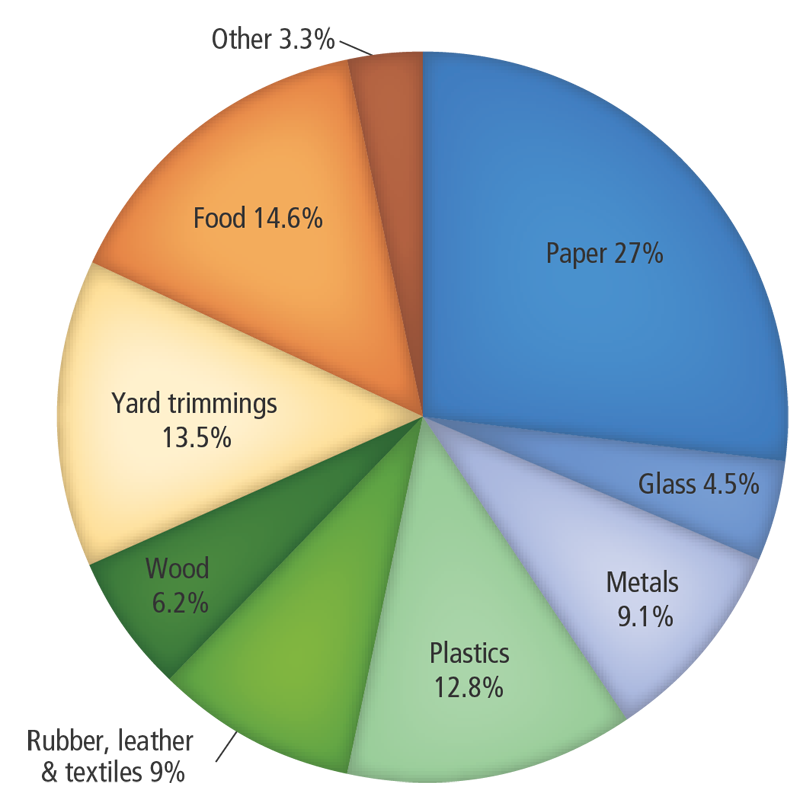 In 2013, newspapers/mechanical papers recovery was about 67 percent (5.4 million tons), and about 60 percent of yard trimmings were recovered (Figure 3). 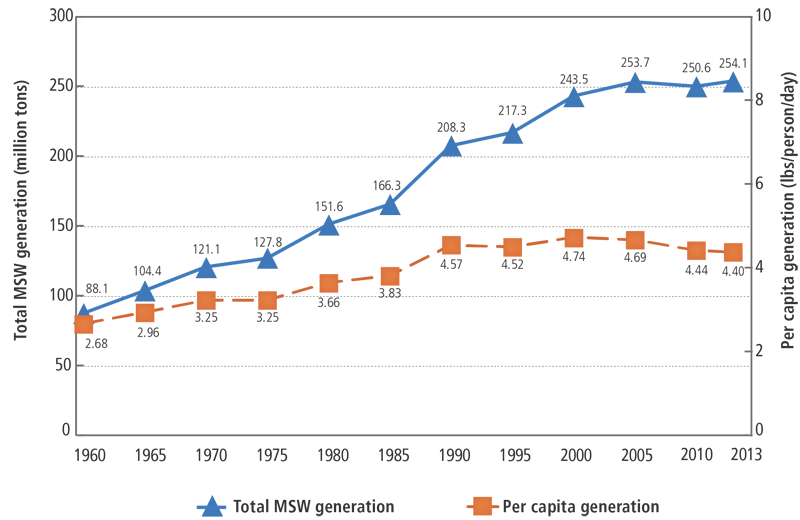 Organic materials continue to be the largest component of MSW. Paper and paperboard account for 27 percent and yard trimmings and food account for another 28 percent. 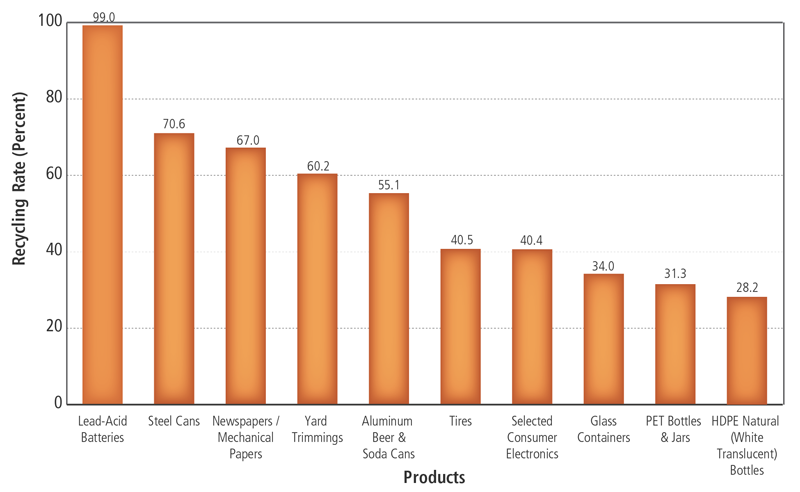 Plastics comprise about 13 percent; metals make up 9 percent; and rubber, leather, and textiles account for 9 percent. Wood follows at around 6 percent and glass at 5 percent. 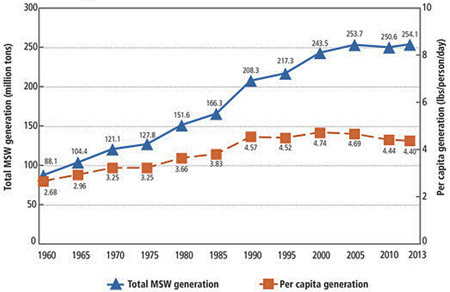 Other miscellaneous wastes make up approximately 3 percent of the MSW generated in 2013 (Figure 4). Landfills are engineered areas where waste is placed into the land. Landfills usually have liner systems and other safeguards to prevent polluting the groundwater. 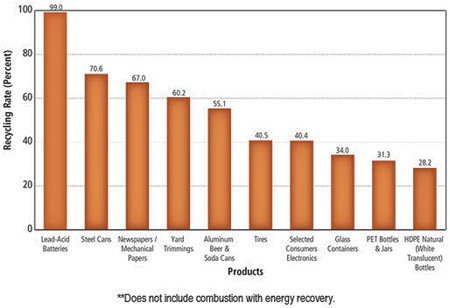 Energy Recovery from Waste is the conversion of non-recyclable waste materials into useable heat, electricity, or fuel. Transfer Stations are facilities where municipal solid waste is unloaded from collection vehicles and briefly held while it is reloaded onto larger, long-distance transport vehicles for shipment to landfills or other treatment or disposal facilities. 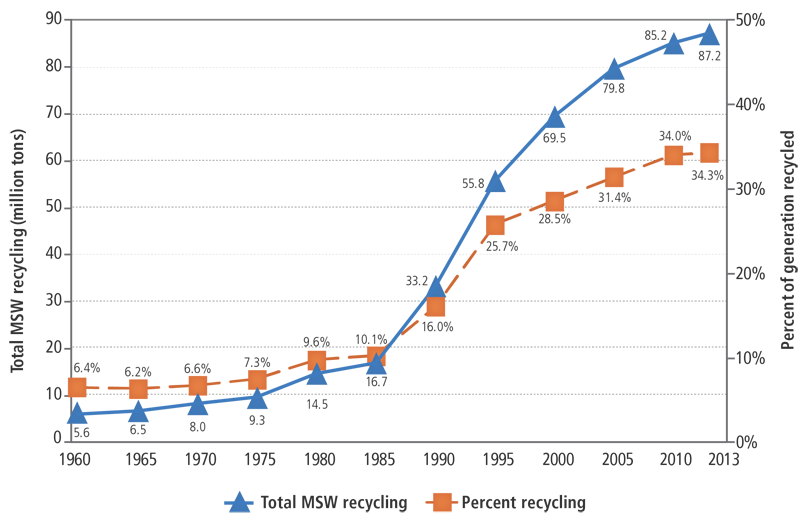 Recycling and composting prevented 87.2 million tons of material away from being disposed in 2013, up from 15 million tons in 1980. This prevented the release of approximately 186 million metric tons of carbon dioxide equivalent into the air in 2013equivalent to taking over 39 million cars off the road for a year. 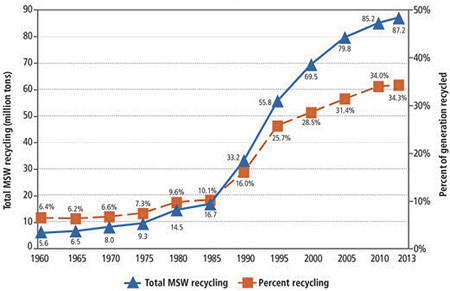 Learn more about how common wastes and materials, including food and yard wastes, paper, metals, and electronics, contribute to MSW generation and how they can be recycled.